The First World War was the first conflict in which film became a significant instrument of propaganda. For the United States, the war had two distinct phases: from August 1914 to April 1917, America was officially a neutral country; after April 1917 the United States was in the war, providing men, money and munitions for the Allies. These two phases are mirrored in the newsreels and documentary films shown in the United States. 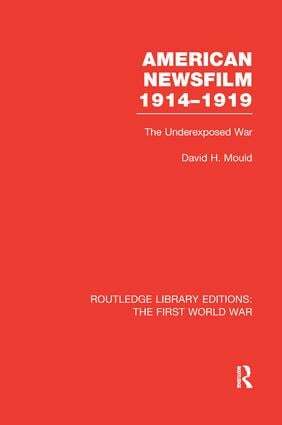 This volume starts by examining the background to the war for the movie industry – the coverage of previous conflicts and the growth of the newsreel. It examines the experiences of American cameramen who worked in the war zone: their efforts to gain access to the front, to overcome problems ranging from unreliable equipment to poor lighting conditions to evading censorship and how this shaped the coverage of the war.